UPDATE: Hey Mr. Bay, in case you happen to stumble upon our site this fine evening, you should check out our report of the Transformers Movie Preview Event from NYC last February! I was at the Princeton campus yesterday to watch filming for Transformers: Revenge of the Fallen! After making a few wrong turns through town I finally saw these signs and followed them. After all we fans are the true "VIP's" if not for us these guys wouldn't make any money. I drove around the campus and stumbled upon a street lined with production vehicles and even turned a few heads of the film crew with my silly little Neon (although it was probably because they were seeing a fanatic driving by the set AGAIN). At this point i found a parking space and hiked it over to where all the trucks were. Sadly, I couldn't get any pix of the trucks and all i could see in them were a lot of electrical equipment and carpentry things, nothing fancy. I left truck land and trailed a grip who was riding a bike in hopes he would be lead to where the filming was going to take place, and i was right. After finding a good vantage point and unsuccessfully trying to take some covert pix with my phone i got a glimpse of Shia leaving his light blue Escalade that some other sites have reported seeing him in. Then Shia walked into a building to start filming (i know the picture is HORRIBLE but its the best i could do, i assure you hes there). As far as what was being filmed, i dont know for sure. This is my theory from being there and putting together the puzzle pieces to the best of my ability after listening to random crew and extras. The shots from yesterday (6/25) would be the classroom scenes that would happen early in the film. The "Frenzy" like robot i believe is Laserbeak, after speaking with extras who claim they were there the prior day and were instructed to run from some sort of "flying creature." Sam, late for class, fumbles through the courtyard with arms full of books. Sam arrives to class late and is greeted by the professor (Rainn Wilson) "Thank you for joining us Mr. Witwicky" and then followed by some witty banter between the two. Mikeala visits Sam on the campus and insert whatever was shot in Philly a few weeks ago. There is a scene in the cafeteria where Laserbeak bursts in and attacks, everyone is sent running in a panic. Sam escapes to the Saturn, still being chased he crashes into the light post and Laserbeak lands on the windshield to attack. I suppose we will know for sure how true this is in exactly one year from today! But until then its a good theory and will be interesting to see if it turns out to be true. UPDATE: Bay has posted on his message boards in reference to the Bot in question. 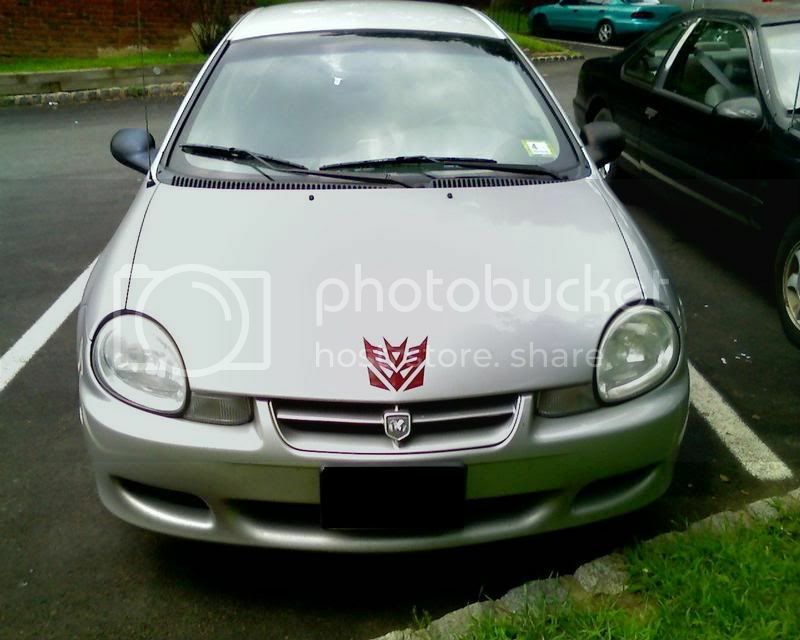 "What that picture is - that is not a complete Transformer. We use detailed puppets for effects for sizing and color - the real effects are later completed but the robots are much more complicated. Great info HE!!! and dont worry about the picture quality Soundwave is no Reflector. If that "brother of Frenzy" in the picture isnt Lazerbeak, then it could mean that we bet both Lazerbeak and Ravage in this movie! I knew it was Laserbeak! I still say it looks more like ravage or mabey Ratbat if it is a "flying creature"
Question: If that is Laserbeak or even Ratbat, where are the wings? Seeing the video (from previous post), I saw no wings or anything to indicate where there would be wings. That's not the whole body. It's just a puppet of the head and claws. I didn't see any cameras around the outside of the car in the video from before, so maybe the scene will be seen from the inside of the car, which would mean that all they need to show are the head and claws. Plus, if that's Ratbat, since when do bats (or rats) have long necks? That doesn't look anything like Ravage. Laserbeak, yes. They're filming at Princeton? Couldn't afford to go to Yale? Mabey it one of those strange gimmics like those head lights/eye like things in Barricade car mode from the first movie just before he transformed in front of Sam. "where are the wings? Seeing the video (from previous post), I saw no wings or anything to indicate where there would be wings." I'm just saying its a bit soon to be definitively saying "Oh its Laserbeak!". Until solid confirmation comes along, I'm calling it as inconclusive. Agreed, could be Laserbeak, could be Ravage, could be Rumble...heck, could be Wheelie for all we know. "I'm just saying its a bit soon to be definitively saying"
I understand that. Im just simply calling it Laserbeak because its easier than "The frenzy like robot"
364 days left, can't wait, i guess some of what u were saying were very interesting spoilers. I hope that wasnt what lazerbeack was supposed to look like in the movie. Well, if Frenzy was silver, skeletal, and small in the first film, who's to say that the other ex-Cassettes won't be the same? Why are we still fighting about this topic on the "Frenzy" thing? For the last time it's Lazerbeak. And Luketroop, that's not what he'll look like. They still have to add color and effects to it. Lazererbeak/Ratbat might be getting his/her wings+color in PP, but I'm not entirely sure. We dont know for sure that its Laserbeak everything at this point is pure speculation. Youll see in the update i posted a little more info on the bot in question. What Bay said could further my theory of it being LB the wings could be added in post to look more natural. But who knows it could all just be misdirection at this point. also where is the pic of the mystorious decepticon spy? and......THE TWINS ARE GONNA BE AN ICE CREAM TRUCK!!!!!!!!!!!! !YAY FOR ICE CREAAAAAAAAMMMMMMM!!!!!!!!! !